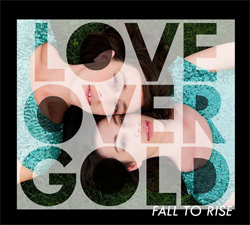 Love Over Gold is a new project for Australia’s Lucie Thorne and American singer-songwriter Pieta Brown. Recorded in Brown’s home town Iowa, the debut album Fall to Rise is a sparse collection of tracks stripped bare of any excess and presented with an intimacy that immediately connects. At times the sound of Love Over Gold draws from an Americana tradition, while in other moments it sounds like a winter’s evening in the front bar of any decent Melbourne pub. The consistent aesthetic that runs through Fall to Rise is the unison vocals of Brown and Thorne, with only rare moments where either voice is heard in isolation. The effect is a sense that the listener is invited to share in a very personal conversation between trans-global contemporaries. For most of Fall to Rise the voices of Lucie Thorne and Pieta Brown are accompanied only by acoustic steel-string guitar. On tracks like ‘Coming Up Crimson’ where electric guitar is used, the amplification is so minimal it sounds as though the lead is plugged directly into the recording console – or perhaps directly into the listener’s middle ear. Ultimately Fall to Rise satisfies because of the connection it makes with its audience. That connection is unimpeded by excessive studio production or lavish instrumentation. Instead Lucie Thorne and Pieta Brown allow us to share in their own very personal conversation and reflect on a world where we’d choose to take love over gold.